Some of the finest faucet models in the 3D Warehouse just got a whole lot more awesome recently. Brizo and Igloo Studios have released 103 new Sketchup models of some of the best faucets around. They're available for free on the 3d Warehouse for you to use in your next Sketchup model. They are beautifully modeled as well. 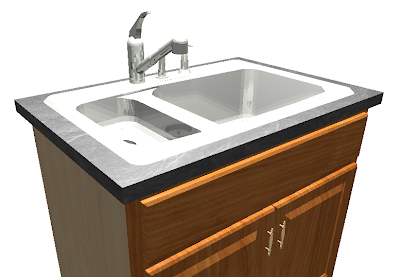 Take a look at this side by side comparison of a Sketchup model, and an actual faucet. I know what you're thinking, it's rendered. Well, it's not. Igloo has a fantastic method of taking photo textures and wrapping them around 3D models so that these faucets look great at any angle. Dimensions, model numbers, and even a link back to the faucet on the website are all there. Brizo has always been very outgoing and friendly to the design blogger community. Over the past few years they've invited bloggers to come out to Fashion Week in NYC to participate in wonderful design challenges with them. I was lucky enough to be one of those. Back in November they reached out to all of us and gave us a challenge: Design a bathroom with the new stylish line of Jason Wu products they are releasing. I did, and while I didn't win, Kerrie Kelly did. You can see her winning design here. Great work, and it was a nice touch with the Jason Wu quote! Congratulations! How much better does that look? Even if you don't like that faucet, the beauty is in the utility, as that faucet ACTUALLY EXISTS! Yes, its a Brizo Faucet that can be found right inside Sketchup from their 3D warehouse collection. So whether or not you think its good looking or not, your client might love it! Thats right, without ever leaving Sketchup you can search for, and insert Delta and Brizo faucets right into your model! Imagine doing a design with a client, and you are deciding on faucets, would you rather flip through a spec book, or show them their faucet, in their kitchen, live in 3D?! The best part too is that with the website links, all the options, and prices are right there! Sketchup can help sell kitchens, and now it can help sell faucets! Miami Vice was good, but who really watches that show anymore? Try these models out, open Sketchup's component browser, and search for "Brizo"